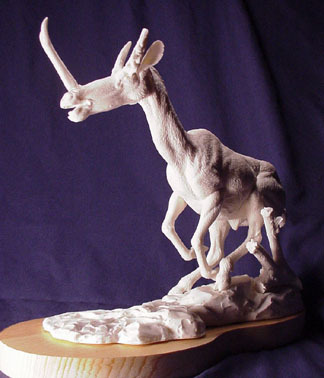 Synthetoceras tricornatus: Six piece model, head, body and rear legs together, front legs and horns separate.Included is a simulated terrain base with rear footprints for positioning and pinning. Base has an attachable tree stump from which a pin can be inserted into the left thigh for stability and support. Model also comes with an oval pine base for display. The model comes unpainted, easy to assemble and requires some seam & putty work around nose horn before painting. Synthetoceras tricornatus cost $93.00 plus $8.50 for shipping and handling within the U.S.